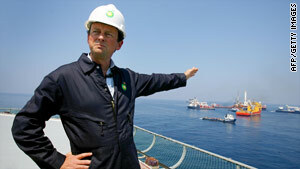 BP CEO Tony Hayward was spotted out sharing dinner with Admiral Thad Allen. Reporter's Note: President Obama continues to deal with oil, and a daily letter from me. One of the weirder moments to occur this week, as we all dredged through Oil Watch: America Held Slippery was the story related by CNN contributor and Democratic strategist, James Carville. Seems the every-biting-bald-one strolled into a restaurant in New Orleans and spotted your chief officer on the scene, Admiral Thad Allen, sharing dinner with the head of BP, Tony Hayward. The fact that James did not chase the pair through the kitchen wielding a sharpened breadstick is a measure of impressive restraint, considering his outrage over this mess. I know both of these men need to eat. I suppose we should applaud their willingness to continue their discussions even in lieu of a full-on lunch break. But it just looks bad. It looks like precisely what so many voters fear; political players, Democratic and Republican, are so deeply in bed with the large money folks, like BP, that they simply find it impossible to really play tough. In the real world, people caught up in a brutal, life and death struggle with so much at stake, and supposedly potential criminal charges in the works, would find it unseemly at best, unethical at worst, to sit down at a restaurant and break bread like pals. Editor's Note: After Friday's show feedback was overwhelmingly about the oil disaster. Many wrote in with their suggestion on how to stop the flow of oil into the gulf. What do you think? I really have a question. What is being done with the wildlife after they are cleaned and healed from any internal injuries they suffer from ingesting the oil and breathing the fumes? Are they relocated or just released back into this same toxic environment? The think the public wants to know, I know I do. Please take the time to investigate the damage (killing) of the Phytoplankton in the Gulf of Mexico as a result of the BP uncontrolled oil gusher. The Gulf is the most (was) prolific area for Phytoplankton on earth (Planet Earth series). Also, isn't BP already on probation for criminal activities in 2007? Thank you for covering the oil spill honestly. It is truly deplorable that BP can spend $50M on a PR campaign and pay billions to shareholders and they cannot pay fisherman and shrimpers their fair share. He wants HIS life back ... How about the thousands of people that live along the Gulf and have had their lives ruined?